Instead of inter-satellite links, OneWeb’s network will use more than 40 gateways around the world, each capable of “seeing” satellites up to 4,000 kilometers away, according to OneWeb Founder Greg Wyler. Credit: OneWeb. WASHINGTON and SINGAPORE — Among the major new privately financed satellite broadband constellations, OneWeb stands alone in not planning to feature inter-satellite links on its spacecraft. Greg Wyler, OneWeb’s founder, told SpaceNews the reason his constellation of 900 or more low Earth orbit satellites won’t include inter-satellite links is because national regulators have expressed concerns about where traffic from their country will travel and where it will come back down to Earth. Not everyone agrees with Wyler’s view. Erwin Hudson, vice president of Telesat LEO, said Telesat is prepared to address sovereignty concerns nations have on a case-by-case basis. “We have the flexibility in our network control system to route traffic all kinds of different ways. There are no rules that traffic has to go over the inter-satellite links,” he said. If a country demands traffic lands on their soil, Telesat will be able to do that, he said. Telesat, like SpaceX and LeoSat, plans to incorporate satellite-to-satellite links on its future constellation, opting to route traffic in space and reduce reliance on ground stations scattered across the planet. Hudson said the benefits of decreased signal latency, faster constellation initialization and a reduction in ground segment operating costs all make inter-satellite links worthwhile from Telesat’s perspective. LeoSat has highlighted a similar concern even though its proposed 84-satellite constellation does feature inter-satellite links. Speaking at the CASBAA Satellite Industry Forum June 25, LeoSat CEO Mark Rigolle said some countries “will require us to route everything through the gateway before it goes out of the country or comes in from abroad,” weakening one of the company’s unique selling points. “They see it as a big benefit that we can come up from anywhere on the Earth, go through the inter-satellite links, and come down anywhere on the Earth,” Hudson said. Hudson said Telesat will likely use “a couple dozen,” and add more as demand increases the amount of traffic on the network. 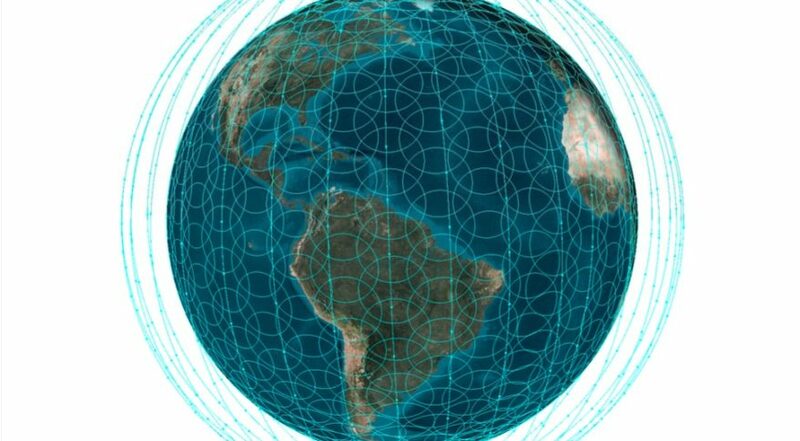 A June presentation to the International Telecommunication Union shows an eventual network of 50 Telesat gateway stations. Telesat is planning four optical inter-satellite links — one on each side of a spacecraft — and a radio-frequency link to the ground. Hudson said the sensitivity of optical links to weather led to the decision to keep the ground link in Ka-band. For OneWeb, Wyler said the absence of inter-satellite links means each satellite will be lighter, and simpler, reducing the risk of malfunctions. OneWeb, with manufacturing partner Airbus, was aiming for 150 kilograms per satellite, but managed to cut that down to 145 kilograms. The first 10 satellites launch on an Arianespace Soyuz late this year. Hudson said Telesat is requiring all the optical links on its satellites, along with the related electronics, to constitute no more than 10 percent of the mass per spacecraft. Telesat LEO spacecraft will feature onboard phased array antennas, processors and other equipment that will make them materially larger than OneWeb’s satellites, he said, but declined to give a specific size. Telesat has yet to select a manufacturer for its constellation, which it hopes to have in service by 2021.